We are the leading manufacturer and supplier of SS rods with accessories in India. These are manufactured from state of the art technology and high grade raw material. These are very economical and are known for their durability. With the high demand in the market, we are betrothed in manufacturing and supplying qualitative Curtain Rods. 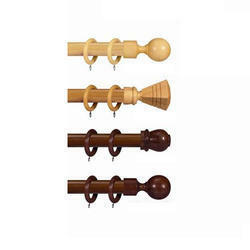 In order to retain remarkable position in this industry, we are providing a wide array of Curtain Rods. Our valuable customers can avail from us an attractive assortment of Fancy Curtain Rods within the stipulated frame of time. These products are made from high quality components. 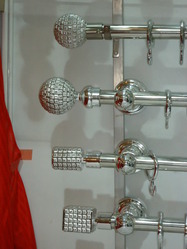 We present irresistible range of curtain rods, beautiful enough to be the starting point of your window dressing. Each rod is a state-of-the-art masterpiece. Whether it is subtle, elegant, or a boldly beautiful one, we have eye-catching designs with beautiful colours in exquisite textures and finishes. Over 150 combinations to choose from, our Drapery Rods are a fashion statement by themselves.